How much do events cost at Dragonfly Farms FL? 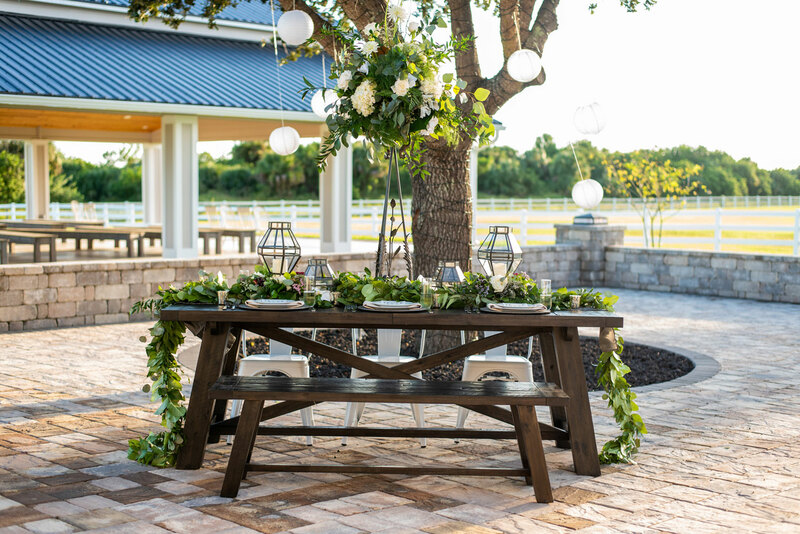 The average cost for events at Dragonfly Farms, FL are as follows: $5000.00 for Monday – Thursday; $5500.00 for Fridays and Sundays; $6500.00 for Saturdays. Vow renewal and elopement packages are also available. We offer a discount for events with less than 75 guests. Do you offer military or charitable event discounts? Yes, please contact [email protected] for more details. Yes, the barn is fully air conditioned. How many people will Dragonfly Farms FL accommodate? We are able to accommodate up to 150 guests. We are located at 750 Osmosis Dr. SW Palm Bay, FL 32908. We are approximately 35 minutes southwest of Melbourne Beach, north of Vero Beach and south of Cocoa. Yes, our property can accommodate your parking needs. Parking is close and easy. You may choose to hire parking attendants (licensed and insured) if you desire to add an extra elegant detail for your guests. What time can I have my event? Events can take place from as early as sunrise and end as late as 10:30 PM on Saturday, 10:00 PM on Fridays and 8:00 PM on Sunday through Thursday. Will there be someone to help me during my event? Yes. A facilities team is provided for the day of your event (This is not the same as a day of wedding coordinator). The facilities team will be able to help answer question for you and your guests and make sure all your facility needs are met. If you have a wedding planner/coordinator, our team will be happy to work with them. Will there be multiple events on the same day? No. We only host one event at a time to ensure your event and guests get all the attention you deserve. Can I have food and alcohol at my event? Of Course. Approved (licensed and insured) caterers and bartenders/servers are welcome. You may provide your own alcohol or your caterer can provide it for your event. Cash bars are not permitted. All alcohol must be served from the bar and passed by a licensed server. Clients are expected to follow all laws regarding alcohol and all house rules regarding food service. Yes. At least a $1,000,000.00 (one million) liability insurance policy is required. If you are serving alcohol, a host liquor liability rider is required as well. Insurance is easily obtained online and we will be happy to provide you with information on providers for liability and wedding insurance. No, currently we do not host overnight guests. We are close to local hotels and can provide you a list if needed. We host weddings, receptions, showers, vow renewals, elopement packages, birthdays, retirements, corporate events, charitable events and others. Please call if you have questions. Do you have a place where I can get ready? Yes. We have two lovely appointed bridal suites. These climate-controlled suites allow you a comfortable place to prepare for your nuptials. A non-refundable deposit of $1,000.00 is required to save the date. At the time of deposit a contract will be executed detailing your event and the costs associated with your event. A $500.00 security deposit is required for all events and is 100% refundable if no damages occur. Yes. After your initial deposit, the balance can be divided into three equal payments and must be paid in full 90 days prior to your event. We want you to be able to relax and enjoy your event so we take care of all the necessities. The following are included with your venue rental: on-site facilities team, tables, chairs, card/gift area, buffet area, and preparation area for caterer. Clients are also able to use our house linens, table runners and decorations if they choose or may supply/rent their own decorations. Ice-service, cake/dessert station and bar area are also included. We are excited to host your event but understand that things happen and you may need to cancel. Please keep in mind, this is where wedding insurance could be a big help in recovering funds if you have to cancel. In the event of a cancellation by the client, any money paid up to the date of cancellation is non-refundable. It is at the sole discretion of the venue to consider a partial refund, but it is NOT guaranteed. No refund will be considered without proactive notification in writing by the client. If you need to cancel, please send notice in writing to [email protected] as soon as you know you need to cancel your event.